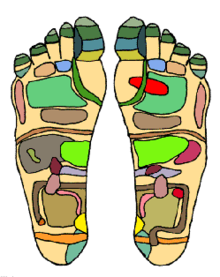 An example of a reflexology chart, demonstrating the areas of the feet that practitioners believe correspond with organs in the “zones” of the body. In 2015 the Australian Government’s Department of Health published the results of a review of alternative therapies that sought to determine if any were suitable for being covered by health insurance; reflexology was one of 17 therapies evaluated for which no clear evidence of effectiveness was found. Accordingly In 2017 the Australian government named reflexology as a practice that would not qualify for insurance subsidy, saying this step would “ensure taxpayer funds are expended appropriately and not directed to therapies lacking evidence”. Concerns have been raised by medical professionals that treating potentially serious illnesses with reflexology, which has no proven efficacy, could delay the seeking of appropriate medical treatment. Reflexology’s claim to manipulate energy (Qi) is unsupported by science; there is no scientific evidence for the existence of life energy (Qi), ‘energy balance’, ‘crystalline structures,’ or ‘pathways‘ in the body. An example of a reflexology chart of the hand, demonstrating the areas that practitioners believe correspond with organs in the “zones” of the body. In the United Kingdom, reflexology is coordinated on a voluntary basis by the Complementary and Natural Healthcare Council (CNHC). Registrants are required to meet Standards of Proficiency outlined by Profession Specific Boards, but since CNHC is voluntary anyone practicing can describe themselves as a reflexologist. When the CNHC began admitting reflexologists, a skeptic searched for, and found, 14 of them who were claiming efficacy on illnesses. Once pointed out, the CNHC had the claims retracted as it conflicted with the UK’s Advertising Standards Authority code. ^ a b Barrett, Stephen (2004-09-25). “Reflexology: A close look”. Quackwatch. Retrieved 2007-10-12. ^ a b c Ernst E (2009). “Is reflexology an effective intervention? A systematic review of randomised controlled trials”. Med J Aust. 191 (5): 263–6. PMID 19740047. ^ “Massage, reflexology and other manual methods for managing pain in labour”. Cochrane Collaboration. Retrieved 2 May 2015. ^ a b Baggoley C (2015). “Review of the Australian Government Rebate on Natural Therapies for Private Health Insurance” (PDF). Australian Government – Department of Health. Lay summary – Gavura, S. Australian review finds no benefit to 17 natural therapies. Science-Based Medicine. (19 November 2015). ^ Paola S (17 October 2017). “Homeopathy, naturopathy struck off private insurance list”. Australian Journal of Pharmacy. ^ Ernst, E; Posadzki, P; Lee, MS (Feb 2011). “Reflexology: an update of a systematic review of randomised clinical trials”. Maturitas. 68 (2): 116–20. doi:10.1016/j.maturitas.2010.10.011. PMID 21111551. ^ Norman, Laura; Thomas Cowan (1989). The Reflexology Handbook, A Complete Guide. Piatkus. pp. 22, 23. ISBN 0-86188-912-6. ^ a b c d “Reflexology”. Aetna IntelliHealth. May 6, 2008. Archived from the original on 2012-02-21. Retrieved February 11, 2016. ^ “Reflexology”. National Council Against Health Fraud. 1996. Retrieved 2007-01-27. ^ Norman, Laura; Thomas Cowan (1989). The Reflexology Handbook, A Complete Guide. Piatkus. p. 17. ISBN 0-86188-912-6. ^ Benjamin, Patricia (1989). “Eunice D. Ingham and the development of foot reflexology in the U.S”. American Massage Therapy Journal. ^ “Massagenerd.com Presents History of Massage, Therapies & Rules” (pdf). Retrieved 2007-10-12. Barrett, Stephen (2004-09-25). “Reflexology: A close look”. Quackwatch. Retrieved 2011-03-14. Carroll, Robert Todd (2007-10-03). “Skeptics Dictionary: Definition of Reflexology”. Retrieved 2011-03-14. Dunning, Brian (28 January 2007). “Skeptoid #24: Reflexology: Only Dangerous If You Use It”. Skeptoid. Retrieved 22 June 2017. AQTN (2013). “Reflexology in the scientific literature — unbiased compilation” (PDF).